These scrolls were ordered as a pair. The customer wanted larger scrolls 5' in length. So we had to use larger paper and the writing on the characters is very large. For those who don't know, a Bushidou means, "Way of the Warrior" and a Rounin was a "masterless Samurai" either because of the death of the daimyou he served in battle or loss of the master's favor. See wikipedia for a more detailed explanation. Literal meaning is someone carried on the waves or a person aimlessly floating. One thing I wanted to make clear, is that this picture was taken from a Seza position, (kneeling). This is the traditional way to view scrolls, and is the reason that the Ten is longer than the Chi, to provide balance between the artwork and the viewer. For the display, I wanted to use a katana or wakizashi, but could not find my wakizashi and did not have access to a sword. So everyone will need to settle with the fake bonsai. 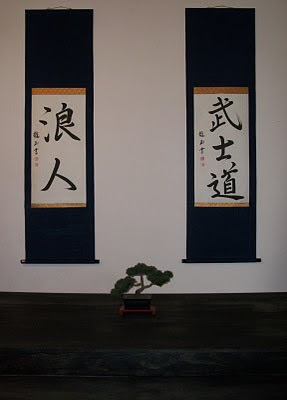 As a set these scrolls are very beautiful in the Navy Blue Cloth with a Green/Gold Ichimonji. Additionally, the Jikusaki are wood with black lacqer and a single band of gold around the outer edge. Gives a little distinction to contrast with the navy colored cloth. The two掛け軸 kakejiku are written in the Gyousho, Semi-cursive style by Ryugyoku.